San Diego is California’s second largest city, and was California’s first city. San Diego Bay is a world class yacht rental destination. This is also one of the best birdwatching places in the US especially on a boat in San Diego. There are also over 92 golf courses, one of the best zoos in the world, great museums, including the USS Midway. San Diego Catamaran charter is also a great way to experience this town. A catamaran in San Diego can let you have a great party yet stays still on the ocean. Of course any yacht rental in San Diego will let you experience the wonderful San Diego Bay Marinas. There are many reasons that make chartering a yacht in San Diego a popular option. For Yacht rentals San Diego is amazing thanks to a climate rated as one of the world’s best. No matter what the season, there is usually great weather in San Diego. Yacht rentals in San Diego take you out on the huge, sparkling, harbor, ringed by the colorful downtown skyline, the bay bridge, Coronado island, and Navy warships. There are countless things to watch while boating in San Diego. Our San Diego yacht rentals are also popular for bachelor and bachelorette parties, corporate parties, and not to mention a fantastic place for marriage proposals. People who like fishing will enjoy the San Diego deep sea fishing boat rental. Also very popular in season is whale watching in San Diego. Catamarans make a perfect party boat in San Diego for family and friends. Hire a boat in San Diego and bring a picnic lunch or your favorite drinks. Simply choose your favorite yacht rental in San Diego, call us for any question or just book online, then just show up on time and you are good to go. 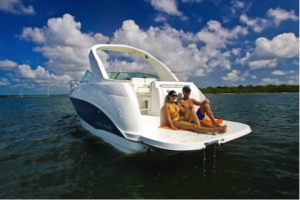 We work hard to make your charter a boat in San Diego affordable and easy. In old California, the bells of the Spanish mission would welcomed boats into San Diego bay. Today, let OnBoat welcome you aboard your private charter yacht in San Diego.